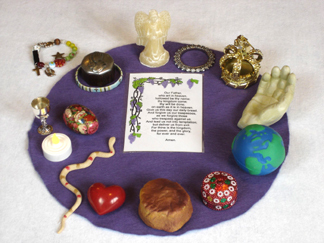 I decided to find some objects to represent different things in the Lord's Prayer. I chose a purple cloth to put them on, because purple symbolises the kingship of Christ. I chose a circular shape because it symbolises God's eternal love. I put a card with the Lord's Prayer on in the middle, and arranged the objects around it. Each line of the prayer has an object to explain it. You can 'read' it clockwise from the top. I placed a bracelet which tells the story of Christ's life using beads beside the prayer, to show how the Lord's Prayer fits into Jesus' life when he was on earth. After I had done this I thought it might be interesting to try and depict the Lord's Prayer with ordinary household objects. That way it could be used by someone who didn't have lots of religious symbols at home. Also, it might help to relate it to everyday life. This is a lot more difficult, and I am still working on it! You may also like to look at: The Lord's prayer: an activity for All Age worship.